Home » Dog Training » The 159th EAKC Show.. Are you ready? The 159th EAKC Show.. Are you ready? We are looking forward to the show!! are you? 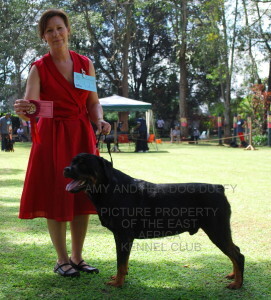 Entries for the EAKC 159th Show are now closed. We have over 200 dogs entered in the beauty classes and a full schedule of Obedience tests including the dreaded “Test C” (very advanced!). A handler’s job is to ‘sell’ his dog to the Judge on the day. A Good ‘Show Dog’ is a combination of breeding, training and attitude. The best dog structurally does not always win but the dog with the ‘here I am what are you waiting for’ attitude is hard to turn down. Stacking medium and Large Dogs – Start with the head, then adjust the feet, place the tail in position, then go back to the head and begin convincing the judge that your dog is the best in the ring. Give the dog the command “stand”. Switch your lead into your right hand and place the left hand on the dog’s loin to keep it steady. If you are fortunate enough to have a near faultless dog this could be the extent of your stacking, otherwise proceed to the next step. Set the head and collar: To do this you slip the collar up under the dog’s chin, making sure any loose skin is pulled from the side of the head to the neck. Hold the head up high. Set the front feet: To do this you grasp the foreleg at the elbow and place the foot so that the pastern and elbow are in line with the highest point of the shoulder (the withers). At the same time twist the dog’s head in the opposite direction of the leg you are adjusting. This shifts the dog’s weight to the other three legs and makes the leg you are adjusting easier to move (especially appreciated with giant breeds!) With your left hand adjust the left front leg then, after transferring the lead into your left hand, adjust the inside right front leg with your right hand. As a simple rule of thumb, it is – left with left and right with right. Your thumb should be in front of the elbow. The dog’s toes should be pointing straight ahead and the distance between the feet should be equal to the width of the dogs’ chest. Set the back feet: To do this you grasp the hock joints and place the feet so that the rear pasterns are vertical. Both rear legs are adjusted with your left hand. 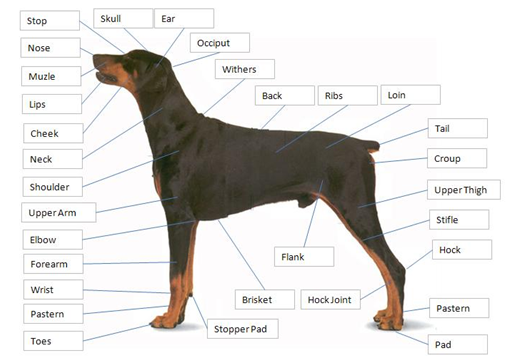 Your thumb should be at the top of the hock joint pointing away from the dog. Whether you set the left hind leg by reaching under or over the dog will depend on the size of the dog. The dog’s toes should be pointing straight ahead and the distance between the feet should be slightly wider than the width of the dog’s hips. When adjusting the feet, lift them, don’t slide them! If it is possible, practice stacking in front of a long mirror, you will find this a great help, as it will enable you to see and feel what you are doing. When you stack your dog afterwards without using a mirror you will know the dog is positioned correctly by the way it feels. Both square bodied dogs and dogs that are longer in the body than in height will be stacked the same way. The only exception is the GSD who’s right hand back leg is set under him, approximately in line with his last rib. Put the tail in its proper position with your left hand. For every breed of dog there is a different type of tail, with or without feathering. For instance if your dog has a long tail with feathering it should be given a shake and held as close to the tip or end of tail as possible. If your dog has a docked tail it should be tickled or stroked upwards. If your dog has a curled tail it should be held near the base or root. There will be breeds without tails and when showing these you simply place your left hand against the dog’s inside hip bone. If your dog is standing wagging his tail do not touch it, this is a dream come true! Once the final adjustments have been made you should be at least an arm’s length away from your dog. Wear clothes in colours which contrast your dog’s coat! Amy is an excellent example of how to dress for your dog! She wears great “contrasty” colours in a comfortable dress which works well for all the “crazy postures” of showing. Test your clothes for flexibility – can you bend all the way down to stack your dog and remain decent?